Many stand alone network cameras are set up this way. Each camera is assigned an IP address, generally hosted from within a LAN. Viewers connect to the camera by inputting the IP address details in a mobile app such as “Viewer for AXIS Cams” or “D-Link Cams”. 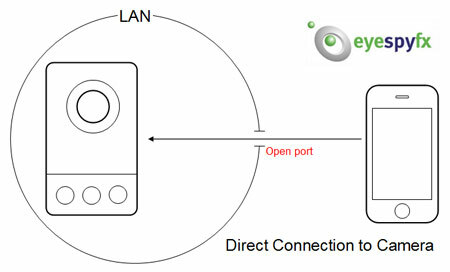 A port in the LAN needs to set to Open and the camera needs to be Port Forwarded if it is to be viewed from a mobile device outside the LAN. This sort of set up is ideal for installations with up to 16 cameras. This entry was posted in iPhone/iPad, Security, Viewer for AXIS Camera Companion, Viewer for AXIS Cams by Antovoda. Bookmark the permalink.